1965 Massachusetts REGISTRATION Sticker - $20.00 : Bob Hoyts Classic Inspection Stickers, Add a Final Touch to your Restoration! This is a 1965 Massachusetts REGISTRATION Sticker. It is not an inspection sticker but you need it to make your vehicle historically correct. 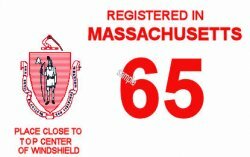 NOTE: Mass did not issue license plates in 1965 and used this stickers to validate the 1965 registration. Without this sticker, the 1965 Massachusetts vehicle was illegal.